Jim is available to speak at your conference or user group meeting. See our sessions page for available topics. Join Jim at Common’s 2018 Fall Conference in Pittsburgh, PA where he will be having sessions on Procedures and Service Programs, SQL & Cursors in Your Programs and Using Integrated Web-Services Server and Service Programs. Learn how from start to finish how to write programs that can be used by both the green screen and the web browser. Join Jim for an All Day Hands on Lab on RDi and RPG. 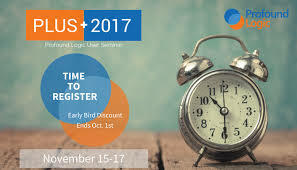 Jim will be giving a keynote session ….. Register today for the ultimate opportunity to add value to your Profound Logic development! PLUS brings together customers, partners, and Profound experts. Contact Us to have Jim Buck speak at your next event.